State/District: New Mexico, Santa Fe Co.
Several masses of total weight about 320lb, the largest of 148.5lb were found, G.F.Kunz, Am. J. Sci., 1885, 30, p.235, 1886, 32, p.311. 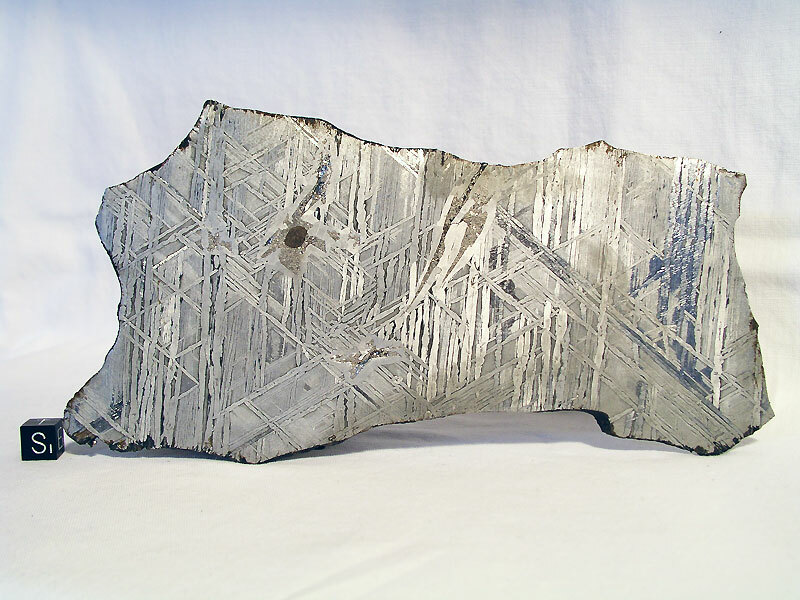 Another mass of 2.5kg was found in Rio Arriba Co. New Mexico and described, R.C.Hills, Proc. Colorado Sci. Soc., 1914, 11, p.1-4. Description, review of older analyses, V.F.Buchwald, Handbook of Iron Meteorites, Univ. of California, 1975, p.597. The Santa Fe iron is identical to Glorieta Mountain, A.L.Graham et al., Cat. Met., 1985, p.152. Recent analysis, 12.04% Ni, 13.2 ppm Ga, 10.7 ppm Ge, 0.014 ppm Ir, J.T.Wasson, Meteorites, Springer-Verlag, 1974, p.307. Cooling rate and olivine composition, Fa13.2, P.R.Buseck and J.I.Goldstein, Bull. Geol. Soc. Amer., 1969, 80, p.2141. Classification and analysis of metal phase, chemically anomalous and distinct from main group pallasites, E.R.D.Scott, GCA, 1977, 41, p.349. Study of olivine-metal texture, E.R.D.Scott, GCA, 1977, 41, p.693. Mineralogy and petrology, contains pyroxene, P.R.Busek, GCA, 1977, 41, p.711. Ag-Pd isotopic composition of metal phase, J.H.Chen and G.J.Wasserburg, LPSC, 1990, 21, p.184 (abs.). Nitrogen isotopic composition of metal and silicate, C.A.Prombo and R.N.Clayton, GCA, 1993, 57, p.3749; see also, LPSC, 1984, 15, p.655 (abs.). Oxygen isotopic composition, R.N.Clayton and T.K.Mayeda, GCA, 1996, 60, p.1999. Cooling rate determination based on size of island region in cloudy zone of taenite, C.-W.Yang et al., MAPS, 1997, 32, p.423. Porosity, D.T.Britt and G.J.Consolmagno, LPSC, 1997, 28, p.159 (abs.). 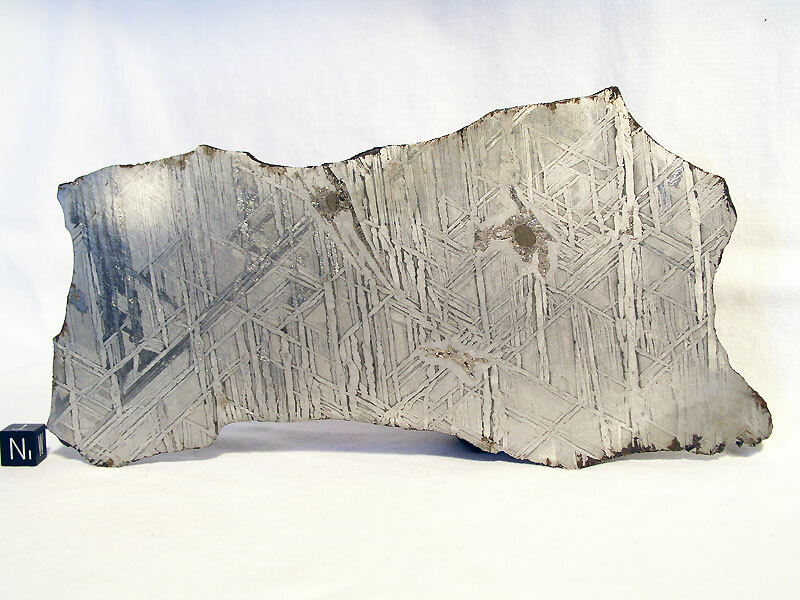 Study of metal phase microstructure formed at low temperatures, C.-W.Yang et al., GCA, 1997, 61, p.2943. Physical properties, density and porosity data, G.J.Consolmagno and D.T.Britt, MAPS, 1998, 33, p.1231. Trace element abundances in olivine, D.W.Mittlefehldt, LPSC, 1999, 30, abs. #1828. Re-Os dating, J.H.Chen et al., LPSC, 2000, 31, abs. #1505. Re-Os and Pd-Ag isotopic compositions, J.H.Chen et al., GCA, 2002, 66, p.3793. Study of minor element zoning and trace element composition of olivine and phosphates, W.Hsu, MAPS, 2003, 38, p.1217. Chemical analysis and classification, a main group pallasite with anomalous metal composition, J.T.Wasson and B.-G.Choi, GCA, 2003, 67, p.3079. Hf-W dating of metal phase, G.Quitté et al., GCA, 2005, 69, p.1321.